The burner vaporizer coil sits just above the burner grate. 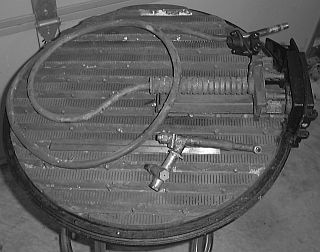 Thus burner fuel (kerosene) is fed into the vaporizer coil at the end shown at the upper right corner of the photo. It then flows out the end of the vaporizer where the heavier cast rings have been placed over the vaporizer tube. The cast rings serve two purposes. First the cast rings protect the vaporizer tube from becoming too hot when no fuel is flowing through the tube by preventing the pilot flame from impinging directly on the tube. They also serve as a mass of metal to heat and thus provide a more uniform application of heat to the vaporizer tube walls. Approximately three-quarters of the vaporizer tube contains a stainless steel wire. The purpose of the wire is to further distribute the heat to the fuel flowing through the vaporizer when the burner is firing. The vaporizer can also become plugged with carbon deposits similar to the pilot vaporizer and pulling the wire allows the tube to be cleaned of deposits. In really severe cases the vaporizer can become so plugged that the wire can not be removed. In these instances an oxygen supply is connected to the supply end of the tube. The tube is heated red hot and the oxygen is admitted. When the oxygen hits the red hot pipe and carbon it ignites the carbon deposits and the pipe burns free of carbon deposits within a very quick period of time. The L-shaped burner nozzle assembly is also shown in the photo. The left end of the longer leg of the nozzle assembly mounts to the end (end with the cast rings on it) of the vaporizer tube. At the opposite end of the long leg is a hex nut that holds an internal filter screen in place. The filter screen keeps any carbon or other materials from finding their way into the fine hole of the nozzle. The actual nozzle is the short cross pipe on the short leg of the nozzle assembly. Close examination of the photo will reveal the small hole in the end of the nozzle hexagonal nut. As was the case with the pilot nozzle, a wire extends through the hole to permit cleaning of the nozzle.